From the outside superyacht Rock.It looks hip and modern but, at the same time, classy and without any on-trend aggressive angularity. In car design vernacular, the 60.35 metre motor yacht is a little more McLaren 675, a little less Lamborghini Aventador. The bow is sharply raked and moderately flared but its raised, bevelled bulwarks and absence of a teak cap rail speak to the 21st century. A curved fashion plate at the main deck and a single angle shared by superstructure and mast above support the illusion of power. Portlights and windows are simple, effective squares and rectangles that, paired with polished stainless louvres and grilles, bring a nuance of industrial chic. The interior is a different melody, played with the most traditional materials: bookmatched flame mahogany, steel and stone. Rather than a disconnect, it is a conversation about classic materials used in surprisingly modern ways. The project began around the 40 metre mark but grew during development to incorporate not only plenty of space for entertaining but also to support a lot of culinary creativity with a large main deck galley. The Feadship and De Voogt/ Sinot Exclusive Yacht Design pairing has occurred before on other contemporary Feadships such as Musashi and Fountainhead, coincidentally also built for American clients. Sinot was founded back in the late 1990s, not in yacht décor but in industrial design and transportation, such as trains and airplanes. This interest in the machine and how things work and fit together is a hallmark of the company’s work just as much as its preference for clean lines and light woods, says the project’s lead designer, Zlatko Imamovic. And therein rose an interesting challenge. The owners’ original brief, divulged Feadship, began with a reference to a yacht that looked “fast on the outside but cosy on the inside”. In the owners’ minds, “cosy” meant dark woods. Rock.It’s owners are Jimmy John and Leslie Liautaud from Illinois, him the founder of the well-known Jimmy John’s sandwich chain. With their three children, they enjoy water sports, entertaining, food and music, not necessarily in that order. After owning several Sea Rays, the Liautauds became interested in sport fishing and bought a 26 metre Merritt sportfisher called III Amigos. Rock.It is the family’s first large yacht, although they have chartered before, which is what, the owner says, led him to Feadship. “It’s the best of the best,” he says. The exterior settled, Liautaud solicited proposals for the interior, including one from Sinot that interpreted “cosy” with various shades of walnut. While he liked the look, he told Sinot he would like it a lot better if it was mahogany with beamed overheads like one of his favourite restaurants in Chicago and several US-built yachts he had seen. Sinot’s next proposal featured a combination of straight grain and flame mahogany, and lots of it, with fielded bookmatched panels as a nod to tradition, mixed with modern gloss joinery on the staircase and in the furniture, with a little marquetry to showcase craftsmanship and copious backlit onyx. 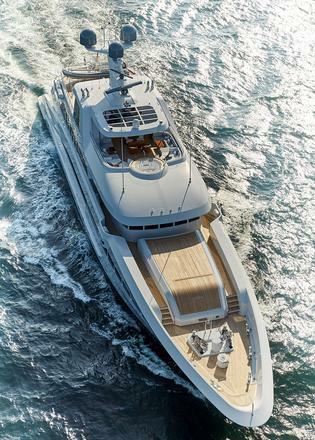 Henk de Vries, Feadship’s CEO, admits that the amount of flame mahogany in the design nearly scuttled the project because the builder and joinery company had such difficulty in finding enough timber sections of similar size and grain. 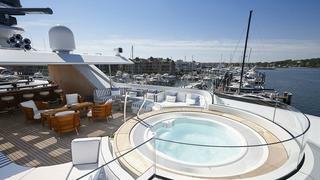 As well as a family boat, Rock.It is designed to entertain. 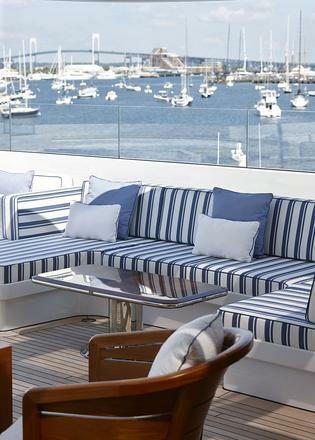 She sports a total of three bars, one of which anchors the yacht’s prime entry point on the main deck. 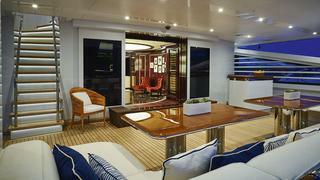 Stepping from the covered aft main deck dominated by a huge teak table, Rock.It changes her tune. A curved onyx bar glows via backlighting, casting a warm light on beautifully veined Portoro marble. A mahogany ring frames a dome in the overhead, establishing the theme throughout the main and bridge decks. Floor-to-ceiling panels of flame mahogany alternate with tall wine display cabinets bordered in sycamore marquetry bands. Sketching an interior that relies heavily on a single joinery pattern is one thing; finding enough veneer to make it work is quite another. Creating the flame look in each panel required four sheets of veneer that needed to be matched for the size of the pattern being achieved. A “book” of veneers from a log has an average of 90 “pages”, of which at least half are unlikely to match as the relationship from limb to trunk changes. The semi-surrounding wall of the central staircase features 168 individual panels that match side to side and top to bottom through three decks. 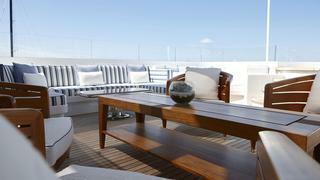 Feadship’s joiners worked through 130 books of veneer on that element alone. Each panel is set into a grid of polished stainless bands pierced by tiny LED lights at the intersections. As the stair surround is obviously concave, Sinot conceived each of the mahogany stair panels as slightly convex to reflect light. 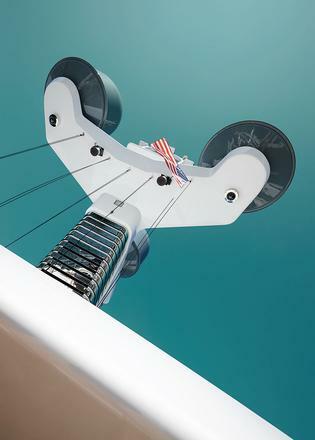 An art niche at bridge deck level displays a small Jeff Koons Balloon Dog sculpture, which acts as a metaphor for the entire yacht: modern art on a classic background. In keeping with the owner’s young family, there is no formal dining room but that doesn’t mean that indoor dining has been ignored. 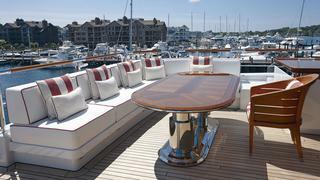 The forward end of the expansive main deck saloon is anchored by a staggering Sinot-designed light fixture hanging over an equally stunning custom table by Pollaro Custom Furniture of Union, New Jersey, in macassar ebony and lighter veneers in a sunburst pattern. There are 188 pieces in the table top alone, each one cut by hand, which took more than 350 man hours to complete. Edging the table is a faceted stainless steel band, which is finished with three small rolled bars, a detail suggested by the owner, who saw the mix of curves and facets on a Graff watch strap. 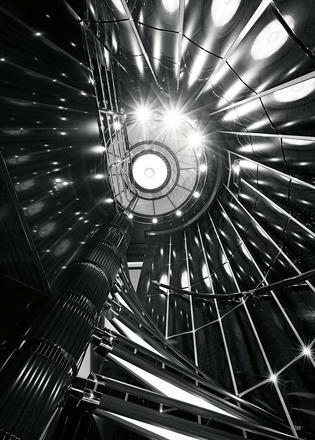 “The client loves polished stainless steel and I introduced it as a contrast element in numerous interior places,” says Sinot. At either side of the dining table, glass bulkheads slide open, leading to terraces folding out from the bulwarks. Interestingly, the terraces open manually but are so nicely balanced that it’s a one-person job. In all there are 30 custom-made Pollaro pieces designed for Rock.It. 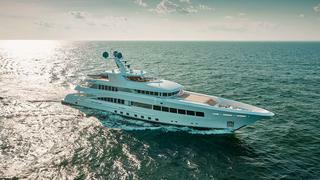 “When we build for Feadship, we are inspired because they create perfection,” says Frank Pollaro. “Our work is a significant investment. Usually owners come to the shop and choose their logs for the colour and grain that interests them.” Pollaro has the largest collection of wood in the world, including an inventory of 500 ebony logs. 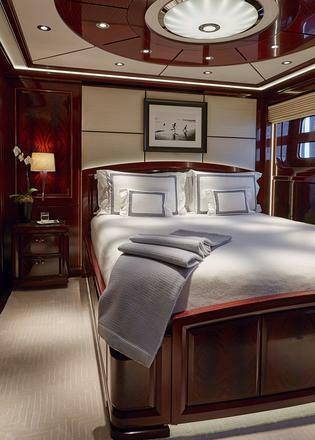 Forward of the circular staircase on the main deck and the amidships lobby with its marble floor is the owners’ full 10.8 metre beam suite, which is all about relaxation and soft lighting created by lots of backlit onyx. 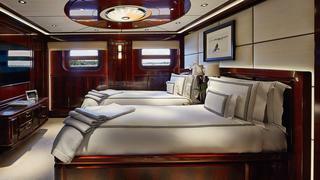 Their children and guests are accommodated in two twin cabins and the pair of VIPs. The doors of the cabins do not face each other, which enhances privacy. Light fabrics contrast with the mahogany joinery and all the beds appear as free standing, with ambient light escaping from underneath. The windows in all the lower cabins are the largest the classification society would allow on a lower deck. Also on this level, the crew cabins are among the first to benefit from the MLC 2006 regulations that require a larger minimum cabin area as well as other amenities. 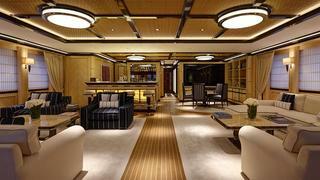 The area is extremely well finished and the engineer has his own quarters aft of the control room. Rock.It’s bridge deck lounge is in a different key. Here, the cross-grain sycamore that appears in such light notes on the main deck is allowed a riff and a few mahogany beams add percussion to an interesting overhead made of woven teak strips. As much of the art on board would suggest, Rock.It’s owners enjoy their rock and roll and the sundeck is the place it really shows. At party time, extra speakers are deployed on all aft decks. A pair of stone-clad bars anchor the gathering space under the hardtop, while an awning deploys aft if shade is wanted; the canopy forward extends almost to the spa pool and sunpads. The overhead is broken by nine skylights of photo-reactive glass that self-darken in bright sunlight. Rock.It is anything but a marina queen. Since delivery in December 2014 she has been almost continuously on the move – completing more than 17,000 nautical miles in the first nine months, according to captain Hendrik Jacobs, who joined the project as it neared completion. Her owners’ first goal was to welcome in the New Year in Miami and, after two weeks in Fort Lauderdale, it was off to the Keys, Panama and through the canal to Costa Rica, Mexico and the Galápagos. “Our itinerary has been fluid,” says Jacobs. “They like the boat so much they are likely to turn up almost any time.” And indeed they did arrive during the Fort Lauderdale International Boat Show, which is where we caught up with them as they were showing the yacht to friends. 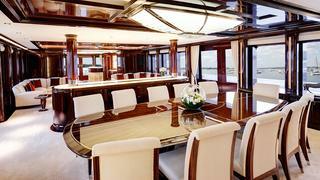 Commenting on the yacht’s itinerary, Liautaud said: “Why not? The yacht is so beautiful I can’t think of a better place to be.” His wife added that it’s her perfect spot to de-stress. In their first season, Cocos island and the coast of Costa Rica generally, where Rock.It was accompanied by III Amigos, were favourite haunts. The Pacific coast of Central America is well known for its billfishing. “Our first stop after transiting the canal was Piñas Bay and the Tropic Star Lodge, which is world famous among game fishermen,” says Jacobs. Alternating between Tropic Star and nature parks such as Panama’s Coiba island and Cocos island, as well as Marina Papagayo and Los Sueños in Costa Rica, the owners, family and guests spent the spring fishing and exploring. A trip to the Galápagos was the highlight of their Pacific adventure. With a full-time guide on board, Rock.It visited five of the islands. The next chapter was to spend the summer in New England for whale watching and trips to historic seaports. This winter will be spent in the Caribbean and next summer in the Great Lakes, where Rock.It will no doubt dazzle the Chicago waterfront crowd. There’s no let-up in that itinerary yet.